Researchers have identified a new strain of methicillin-resistant staphylococcus aureus (MRSA), a drug-resistant bacterial infection that until the last few years was seen primarily among patients in hospitals and nursing homes. 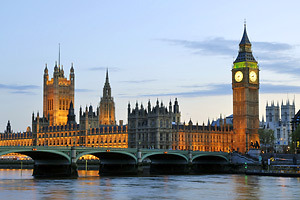 The strain, dubbed New MRSA, has been found in the United Kingdom. While there are over 35 strains of MRSA, New Strain may have originated in cattle, where antibiotic use has become a regular occurrence to thwart mastitis in milk cows. 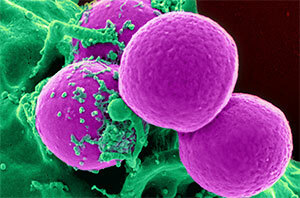 The overuse of antibiotics could be a contributing factor to the mutation of MRSA. Currently the new strain, which shows up in both cows and humans, has been found in less than 100 people in the U.K. The Health Protection Agency said the risk of becoming infected with the new strain was “very low.” By comparison, approximately 20,000 people in the United States die annually from MRSA. “The risk of contracting this new strain of MRSA through drinking milk (from infected cows) is extremely low because the vast majority of cows’ milk is pasteurized and the pasteurization process destroys all types of MRSA,” said a U.K. Food Standards Agency spokesman. While New MRSA has yet to reach U.S. shores, there is a new FDA-approved diagnostic test that will be able to quickly determine staph infections and their resistance to antibiotics. Staphylococci bacteria are common in infections, but many are methicillin resistant (MRSA) or methicillin susceptible (MSSA) and required altered treatment protocols. Being able to rapidly diagnose and correctly treat the infection, can save life and limb. The test, called the KeyPath MRSA/MSSA Blood Culture Test, is produced by MicroPhage Inc. and can determine whether bacteria in a patient’s positive blood culture sample are MRSA or MSSA within about five hours and does so with a 98.9 percent accuracy rate. The MicroPhage test, done through nasal screening, is expected to have significant cost and performance advantages over current testing. Most staph skin infections, including those caused by MRSA, appear as a pimple or boil that may be red, swollen, painful, warm to the touch, have pus or other drainage, and may be accompanied by a fever. More serious infections may cause pneumonia, blood stream infections, surgical wound infections and urinary tract infections. If you or a family member experiences any of these signs and symptoms, you should cover the area with a bandage and contact your healthcare professional. This is especially important if a fever is present. How are staph infections, including MRSA, spread? MRSA is spread through direct contact with another person’s infection, sharing personal items such as towels or razors that have touched infected skin, or by touching surfaces contaminated with MRSA. How can you prevent MRSA? You can prevent MRSA by practicing good hygiene; keeping your hands clean by washing thoroughly with soap and water or using an alcohol-based hand sanitizer; keep cuts and scrapes clean and covered with a bandage until healed; avoid contact with other people’s wounds or bandages; and avoid sharing personal items. Over the past 8 years several essential oils have been tested by researchers and proven to be effective highly against MRSA. Since this research is conducted on behalf of pharmeceutical companies the results are often not made public. However, we can reveal to you precisely which antibacterial essential oils have are known to inhibit the growth of MRSA. 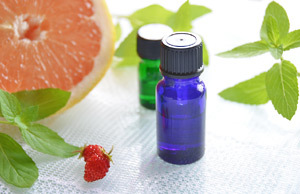 See the sidebar above for a comprehensive list of the most effective essential oils against MRSA. Nice to read some positive news about complimentary medicines using essential oils. All of the following anti-bacterial essential oils have shown an ability to inhibit the growth of MRSA. 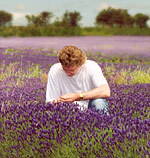 Using the finest quality essential oils is absolutely vital in aromatherapy. Because the purity of the essential oils you use will determine how successful the treatment or products they are used in will be. In aromatherapy, you will only receive textbook results when you use the very purest, highest quality, pure essential oils. 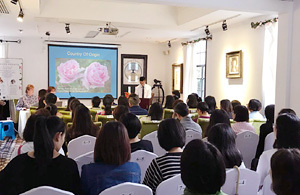 At Quinessence, we believe that essential oil quality control should begin at the earliest stage of production, preferably with inspection of the crop at the growing phase.